(11:50 a.m. EDT) -- Less than one month after Carnival Cruise Line announced it was pulling its ships out of Antigua’s cruise port, officials have reached an agreement that will bring Carnival ships back to the island on new terms. "The Government of Antigua and Barbuda representatives, having had further dialogue with executives from Carnival Corporation, fully understand and acknowledge the misunderstandings of the past," reads a statement issued by the Consulate General of Antigua and Barbuda on Monday. "Both parties expressed their desire to maintain the relationship that has been in place for the last 30 years." Under the agreement with Global Ports Holding, a ports development company, the cruise facilities at St. John’s, Antigua, would be updated and expanded in coming years to accommodate four mega cruise vessels, homeporting operations and improved shopping experiences within the terminal. In an interview with Cruise Critic, Tourism for Antigua and Barbuda's CEO Colin James said the emphasis on improving infrastructure for a better guest experience was key. "In the end, a positive solution benefits everyone." 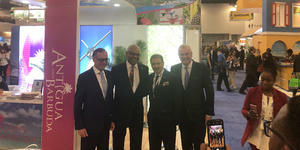 Added Charles Fernandez, Minister of Tourism, Economic Development and Investments for Antigua and Barbuda, in the statement: "The brands of Carnival Corporation have been partners with Antigua for many years and have contributed approximately $48 million to the Antiguan economy over the past five years. Certainly, we appreciate and respect their desire to provide a great guest experience and value to their guests visiting Antigua." The statement continued: "While some calls were rescheduled, other calls that were being considered for cancellation will now call as planned and both parties agreed to continue discussions on the possibility of having more summer calls." Passengers scheduled to sail on Carnival Breeze, Carnival Legend, Carnival Magic and Carnival Pride this November and beyond should check with the cruise line or their travel agent to see if Antigua will be on their specific itinerary. "We are looking forward to a long and mutually beneficial relationship that will bring even greater prosperity to our people," said Prime Minister of Antigua and Barbuda Gaston Browne, in the statement.